Celebrating its 20th year of honoring the industry’s top games, The Academy of Interactive Arts & Sciences (AIAS), the non-profit organization dedicated to the advancement and recognition of the interactive arts representing its 33,000+ membership base, has announced the recipients of the D.I.C.E. Awards for the best games from 2016. 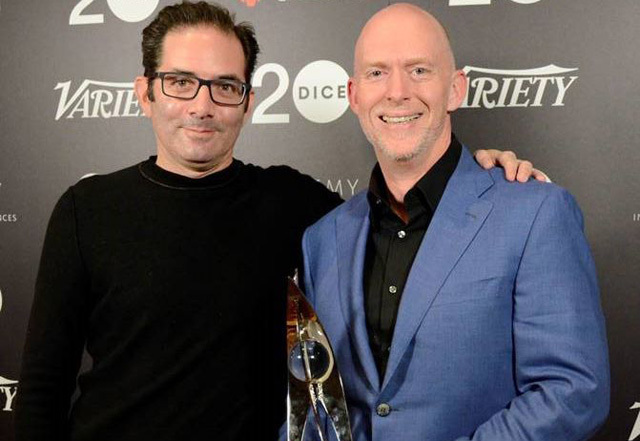 Earning Game of the Year was Overwatch by Blizzard Entertainment (pictured above are Frank Pearce (right) and Jeff Kaplan (left) from Blizzard Entertainment), which challenges players to join the ranks of a legendary force of soldiers, scientists, adventurers and oddities, and clash on the battlefields of a near-future Earth. The awards were unveiled at the annual D.I.C.E. Awards ceremony, held at The Mandalay Bay Convention Center in Las Vegas. The AIAS membership honored games in 24 award categories, including Overwatch and Uncharted 4: A Thief’s End, which received four awards each. INSIDE won three awards, including the D.I.C.E. Sprite Award, which recognizes a game with limited resources for development and exposure (as compared to AAA titles). Other top honorees were Pokémon GO for Mobile Game of the Year, Steep for Sports Game of the Year, Street Fighter V for Fighting Game of the Year and Dark Souls III for RPG/MMO Game of the Year. Winners for newly -dded awards that recognized achievement and innovation in virtual reality and augmented reality games, included SUPERHOT VR for Immersive Reality Game of the Year and Eagle Flight for Immersive Reality Technical Achievement. In addition to the awards for the industry’s best games and creators from the previous year, the D.I.C.E. Awards also honored Todd Howard, Executive Producer and Game Director at Bethesda Game Studios, as the 22nd inductee into the AIAS Hall of Fame, which honors individuals who have been instrumental in the development of highly influential games. Howard was recognized for having created some of the industry’s most successful games by pioneering open-world gameplay, and played a key role in the creative direction and growth of highly-regarded franchises, including The Elder Scrolls and Fallout. Both are known for their experiential approach to world-building and storytelling, and have earning multiple D.I.C.E. Awards throughout the years. Since 1996, the D.I.C.E. Awards have recognized outstanding games, individuals and development teams that push the boundaries of technology, creativity and artistic expression in the worldwide interactive entertainment industry. Titles were played and evaluated by members of the Academy’s Peer Panels. The panels are comprised of the game industry’s most experienced and talented professionals. Each panel is responsible for evaluating one award category. D.I.C.E. Awards recipients are determined by a vote of qualified AIAS members. Award voting is confidential, conducted online and supervised and certified by VoteNet Solutions, Inc. The integrity of the system, coupled with a broad-based voting population of AIAS members, makes the D.I.C.E. Awards the most credible, respected and recognized awards for interactive entertainment software.